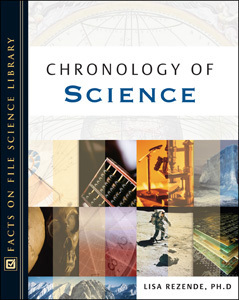 Authored by: Lisa Rezende, Ph.D.
Spanning the vast history of science, Chronology of Science contains approximately 2,000 cross-referenced entries that chronicle scientific progress. Helpful identifiers categorize the entries into core areas (biology, chemistry, physics, marine science, space and astronomy, Earth science, and weather and climate). Also included are introductory and closing essays in each section, sidebars expanding upon important concepts in each time period, figure legends, appendixes directing the reader to further information on specific topics, a bibliography, and an index. This is a helpful reference tool for students looking for basic information about specific scientific events. The entries inspire the reader to investigate the topic further. After reading sections of the book, the reader will have gained accurate information about scientific history, as well as a sense of how scientific discoveries build upon events of the past, and an understanding of the way scientific theories have changed over time. The Expansion of Science in the Information Age (1980-2006). "...useful for high school students and lower-level undergraduates, for public libraries, and as a supplementary title for college libraries." "...well-organized and written at a level accessible to a student...worthy of consideration for middle-school and high-school libraries as well as public libraries and undergraduate teacher education libraries."